We saved you a seat. With Rapid Rewards®, if we've got a seat, it's yours. Rewards Program Agreement: For more information about the Rapid Rewards® Premier Business card rewards program, view the latest Rewards Program Agreement. We will mail your Rewards Program Agreement once your account is established. If you become a Chase Online customer, your Rewards Program Agreement will also be available after logging in to chase.com. How you can earn points: You'll earn points when you, or an authorized user, use a Rapid Rewards® Credit Card to make purchases of products and services, minus returns or refunds. Buying products and services with your card, in most cases, will count as a purchase; however, the following types of transactions won't count as a purchase and won't earn points: balance transfers, cash advances and other cash-like transactions, lottery tickets, casino gaming chips, race track wagers or similar betting transactions, any checks that access your account, interest, unauthorized or fraudulent charges, and fees of any kind, including an annual fee, if applicable. 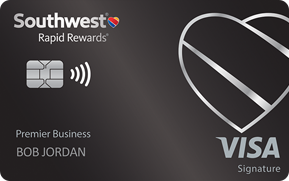 2 points: You'll earn 2 points for each $1 spent on purchases made directly with Southwest Airlines®, including flight, inflight, Southwest® gift card, and Southwest Vacations® package purchases, and at participating Rapid Rewards® hotel and rental car partners. 1 point: You'll earn 1 point for each $1 spent on all other purchases. 1 point on balance transfers: You'll earn 1 point for each $1 of the first $15,000 of balance transfers made during the first 90 days from your original account open date. 6,000 bonus points each account anniversary year: You'll receive 6,000 bonus points each account anniversary year. "Account anniversary year" means the year beginning with your account open date through the anniversary of your account open date, and each 12 months after that. 1,500 tier qualifying points: You'll earn 1,500 tier qualifying points (TQPs) for each $10,000 in purchases up to $100,000 in purchases annually which equal 15,000 TQP. TQPs can be used to count toward qualification for Rapid Rewards A-List or A-List Preferred status. "Annually" means the year beginning with your account open date through the first December statement date of that same year, and each 12 billing cycles starting after your December statement date through the following December statement date. Information about earning/transferring points to Southwest Airlines®: Points earned during a billing cycle will be automatically transferred to Southwest Airlines after the end of each billing cycle. Points expiration: The points transferred to your Rapid Rewards account won't expire as long as your card account is open or you have flight-earning or Southwest Airlines partner-earning activity at least once every 24 months. If your card account is closed, the points in your Rapid Rewards account will expire if there isn't flight-earning or Southwest Airlines partner-earning activity at least once every 24 months. Losing points: You'll immediately lose all points that haven't been transferred to Southwest Airlines if your card account status changes, or your card account is closed for program misuse, fraudulent activities, failure to pay, bankruptcy, or other reasons described in the terms of the Rewards Program Agreement.